In the age of Google we depend on our Web browsers--and on all the features which make them so efficient to use. Personal settings and data such as bookmarks, history, cookies, and saved passwords are essential to productivity. FavBackup (free) recognizes the importance of such data and offers an easy and comprehensive way to back it all up. Perhaps even more useful, you can use the program to migrate settings to a browser on a different computer. 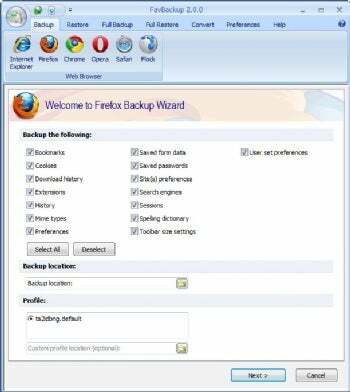 FavBackup can save, back up, and migrate more components than you knew your browser even had.